BSI British Standards BS8102:2009 “Code of practice for protection of below ground structures against water from the ground” is the standard that the industry is governed by. It is essential for the success of any project involving below ground structures that strategies for dealing with groundwater, soil gases and contaminates are considered from early stages of the planning and design. Defects and remedial measures, the designer must consider the possibility of defects occurring , and have contingency planning for dealing with localized defects or system failure that arise and should be included as part of the overall water-resisting design for the structure. The issue of reparability should be taken into account and the feasibility of remedial measures assessed. Structures will often be of masonry construction, plain or reinforced concrete may be used. The latter may be in-situ or precast. The structure is regarded as having no integral protection against water ingress and so relies on the applied waterproofing system to provide the necessary control. Masonry walls may need a cement rendering or flush pointing to produce an acceptable surface for subsequent application of the waterproofing system chosen. The waterproofing system will, depending on its type, tolerate certain construction cracks or minor defects. 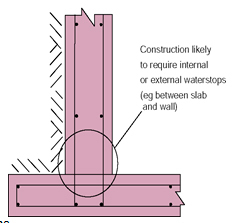 structures will generally be reinforced or pre stressed concrete. Since they are specifically designed to be water-resistant, further waterproofing will be required only where additional control against free water or water vapour is considered necessary. In some instances, the additional protection may be used to safeguard the structure from aggressive chemicals. Any noticeable cracking or defect should be brought to the attention of the designer. A concrete structure, to be constructed as an integral water-resistant shell. To be designed in accordance with BS8007 to waterproof but not vapour proof. If the concrete was poured monolithically there would be no problem at the floor wall junction. Day joints are potential problem areas.